Introduction: Redington has always been a brand known for quality products at affordable prices. Our review of their Rise reel ended with a �great� rating, which certainly describes what many think of the brand. At ICAST 2013 in Las Vegas, we met up with rep Kara Armano and had a tour of new products from several manufacturers, including fresh rod lines from Redington called the Vapen and Vapen Red series. Technically the same rods, the Vapen sports traditional cork grips while the Vapen Red comes equipped with a red polymer non-slip grip. WHAT, a fly rod without a cork handle? The Vapen Red 890-4V sports simplistic and clear ratings. 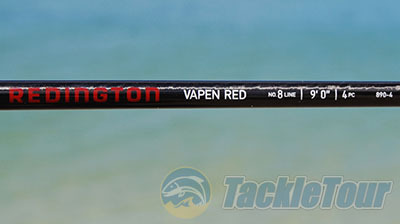 Quality/Construction: The Redington Vapen Red 8 weight is a good looking stick that comes nicely appointed. Rods in this price range are not considered high-end in the fly rod realm, so you can't purchase a rod like this and expect it to exhibit superior build qualities, but the rod didn't fall short of my expectations and I'd actually put it a bit above average. This is a well put together fly rod for the price point and it's craftsmanship and materials shouldn't cause you to regret your purchase. With the Redington products I've used thus far, it's apparent they make a real effort to uphold a higher standard of quality than some other companies. The bright red handle is undoubtedly the first thing you'll notice! The blank of the Vapen Red is glossy, wavy, and dark in appearance. The graphite construction uses �X-Wrap� blank technology that involves counter-wrapping a layer of high-density carbon ribbon both inside and outside of the blank to increase power, stability, and dampening. Finishing off the rod is a cleanly built carbon fiber insert reel seat and that all important bright red handle that we'll dissect a bit more later in the review. 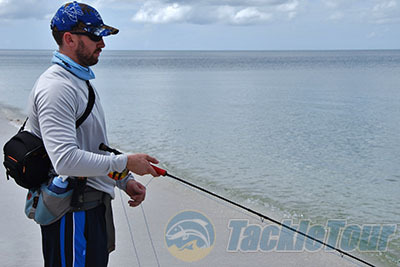 Stripping a fly for gulf snook! 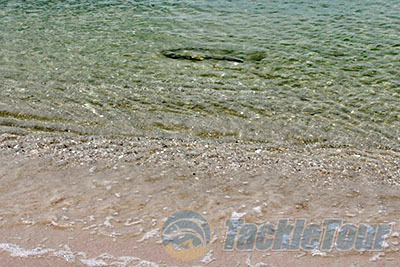 Snook can cruise VERY close to the shoreline, requiring most casts to be less than 25 feet- not the best range for the 8 weight Vapen Red. 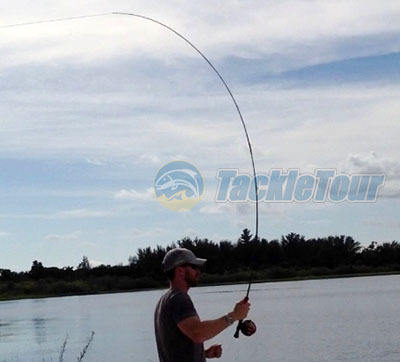 Casting: The Vapen is marketed as a fast action rod, and it certainly feels that way. In fact, during roll casting or up-close overhead casting the rod just felt too stiff. 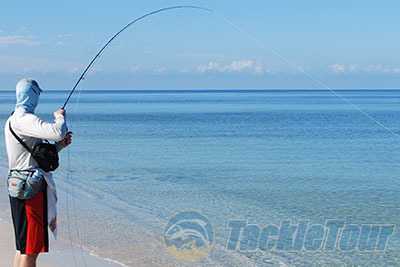 Much of the beach snook fishing I do so often is sight fishing at very close range with a floating line. This rod was not much fun at distances inside of about 30 feet since it didn't load well at all. It also didn't exhibit much feel at this range, though my accuracy was still satisfactory. Here I'm throwing about 50 feet and you can see the rod loads nicely. Once I got more line in the air, the rod started to show off what it could do. The rod conquered medium to long ranges very well. It picked up line easily and was pretty accurate at these more common casting distances. The blank also tracked nicely and had decent feel, likely an effect of Redington using the X-Wrap technology. Despite being able to toss a nice tight loop a great distance, the rod felt a little on the heavy side during the casting stroke. It didn't particularly bother me, but I didn't feel it had the nice lightweight feel of some competing rods. Nonetheless, the Vapen Red is satisfying enough that it shouldn't disappoint you. Fish on! I was momentarily distracted by a large pod of snook working the shoreline as I fought my fish- look closely and you can see them. Next Section: Let's talk Vapen Red "Power"